I’ve been trying to get back more into watercoloring again after a long hiatus from it. I think I mentioned that my kids gave me a 36 pan set of Gansai Tambi watercolours, and I’ve been trying to get the feel of them. They are gorgeously pigmented colours, but they have a more thick opaque quality that you have to get used to a bit. At first I was adding way too much water, and then too much pigment. So, trying to find a happier medium, I pulled out a stamp set I haven’t used in a long time, Altenew’s Persian Motifs. I wanted to emboss it this time because that gives you an “edge” where you watercolour won’t bleed past and it could help a little with my water control. So, it’s embossed on Strathmore Cold Pressed watercolour paper, and then bit by bit I added colour in some cool tones. I’m really loving how it turned out, even though I have lots still to learn. Watercolour is so much more of a patient process, you need to do it in layers, and you need to let the layers dry between those layers. So sometimes the best thing to do is just walk away and let it dry! I also have a paper towel close by so that I can dab any excess water or pigment away. You might not be able to tell, but in the 36 pan set of watercolours, there are 3 metallic shades and I used the clear shimmery pan washed in on the background. 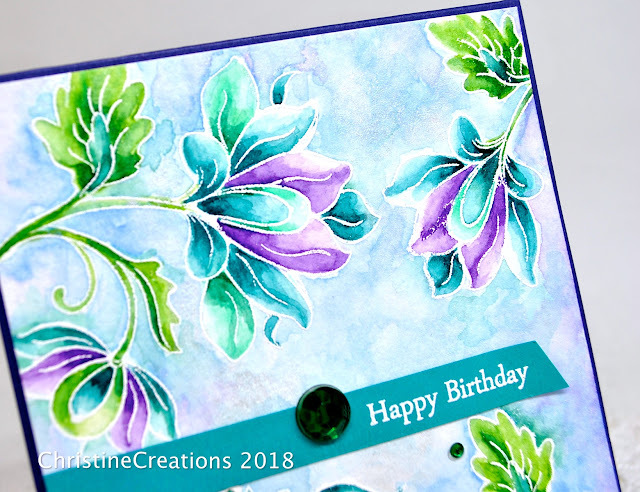 It adds a beautiful shimmery effect when you turn the card one way or another. A simple band of turquoise for the embossed sentiment and some pretty emerald gems complete the design. This is a beauty for sure! I have been taking watercolor classes and got a set of these, and they are sure different- than Daniel Smith, etc.... But you sure accomplished beautiful work and colors! 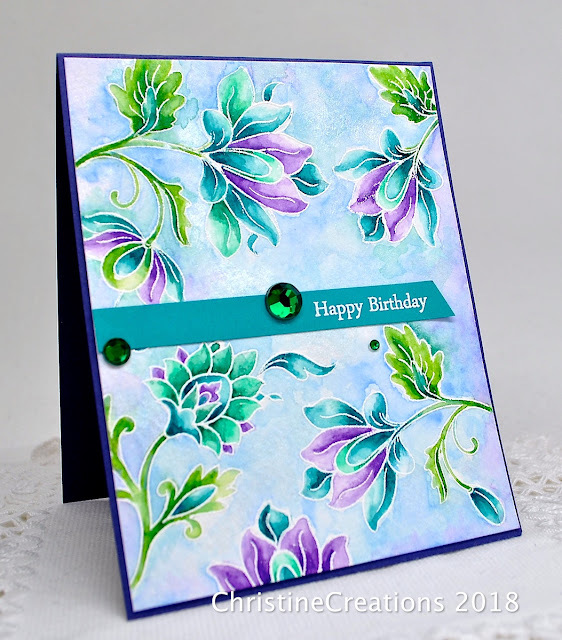 I love the idea of embossing the blooms before painting! You're doing beautiful work with these paints, Christine. I have them, as well, and they are a different feel from inks. I do love them. Truly, watercolor takes patience. It's my favorite medium, but not for when I'm in a hurry, which is all too often. Love painting larger images like this. You've made an utterly gorgeous card. Beautifully done! Love the colours. 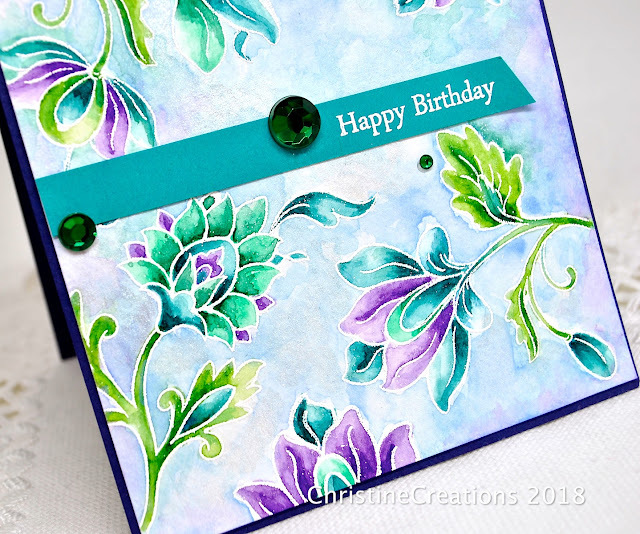 I love the shades of colors in this entire card plus the emerald gems!! This is so beautiful. Your watercoloring is lovely. Thank you for the tips you shared. Stunning this is one of my favourite flowers from Altenew and you have coloured it to perfection in colours that are just perfect for them. So so exquisite.